SpeechBlocks is a medium that allows children (4-5 years old) to engage in open-ended play with writing. They can build arbitrary compositions out of words and associated images, which can become cards, signs, stories, and "books." We hypothesize that such creative, self-expressive play can foster development of basic literacy skills, like phonological awareness. However, because users of SpeechBlocks are not yet in command of writing, it is necessary for the system to scaffold and guide them. We study a variety of ways to accomplish this. One way to scaffold development of phonological awareness is to establish strong mnemonics for sounds. We developed a set of characters that represent various sounds of English language. They do so through onomatopoeia (sound mimicry), producing their respective sounds through some action. 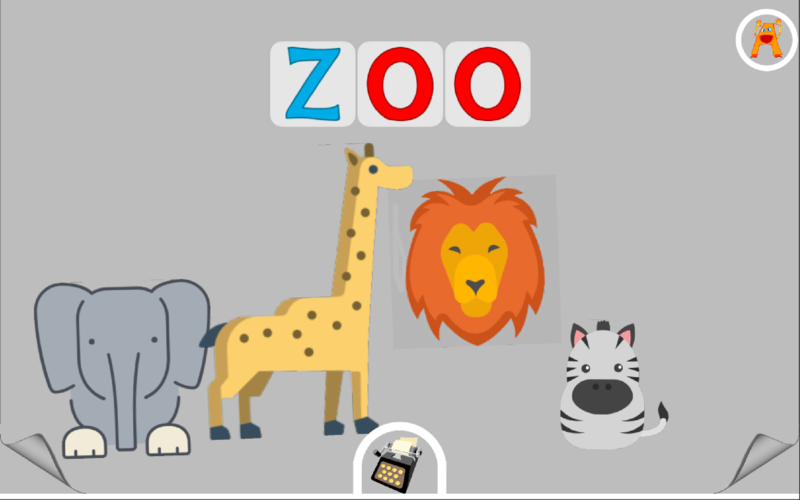 Onomatopoeic characters in SpeechBlocks. Notice what happens when one letter can make different sounds, and when several letters can make the same sound. Perhaps the most important design decision for a construction kit is choosing the set of building blocks. A good block functions in a simple, straightforward way that doesn't change much in different scenarios. From this standpoint, letters are not very good blocks, because their pronunciation strongly depends on the context. We experiment with using sounds directly as blocks for early writing. This video shows the difference between using letters and sounds as blocks. In letter mode, spelling of each block remains constant, but sound changes depending on the context. In sound mode, the sound remains constant, but spelling changes depending on the context. Early spellers often have creative ways to write words: e.g., KT may mean "cat," "kite," or "carrot." These invented spellings are significant intellectual accomplishment for the child, and encouraging them was shown to help with literacy development. SpeechBlocks recognizes and supports invented spellings. SpeechBlocks system guesses what the child intends to spell, and gives suggestions. Exploring the network of related words. Using text recognition allows children to grab words to spell from their environment. The source can be books, but also all kinds of signs, posters and labels. The current design of SpeechBlocks is based on several years of experimentation by several graduate students in the lab. Please follow the links to see early SpeechBlocks and PictureBlocks, which influenced the current design.